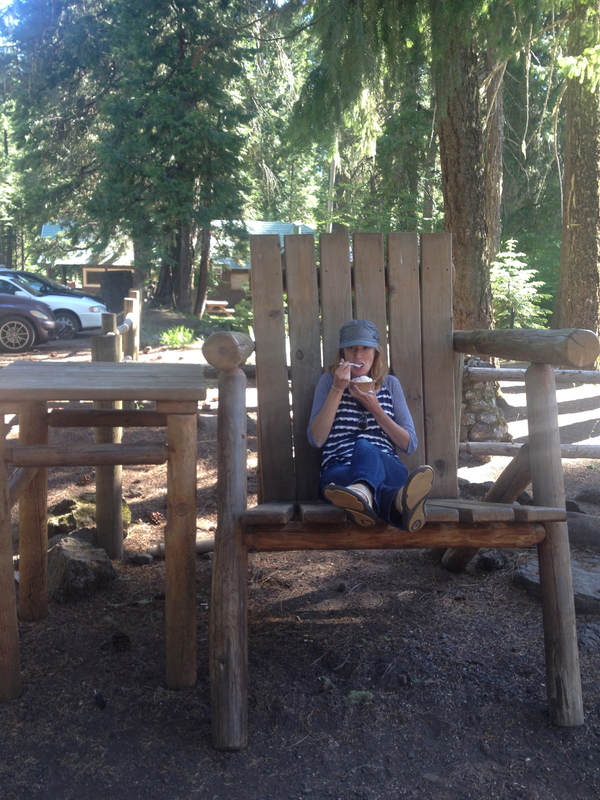 We spent almost a week in Bend, OR on this trip. We fell in love with Bend a few years ago over a Fourth of July weekend. 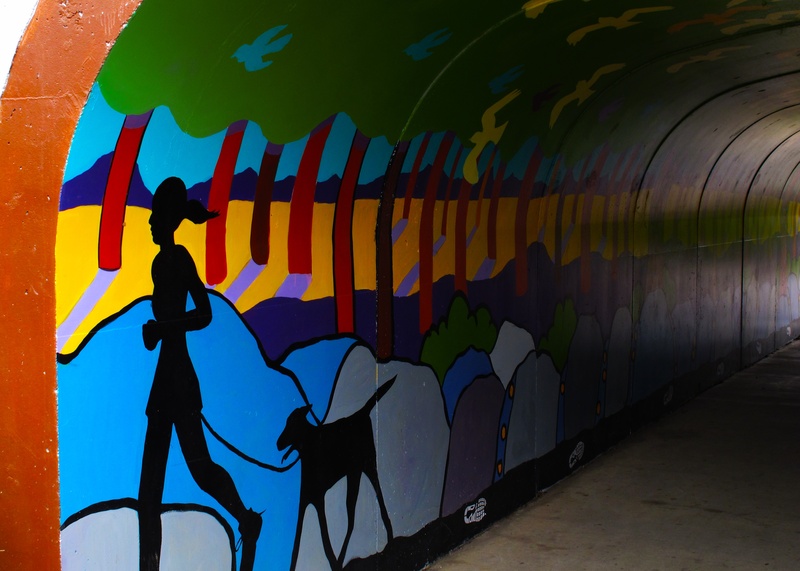 The historic old town area has a some really nice restaurants to choose from and it’s just a couple of blocks from beautiful Drake Park which overlooks the Deschutes River. 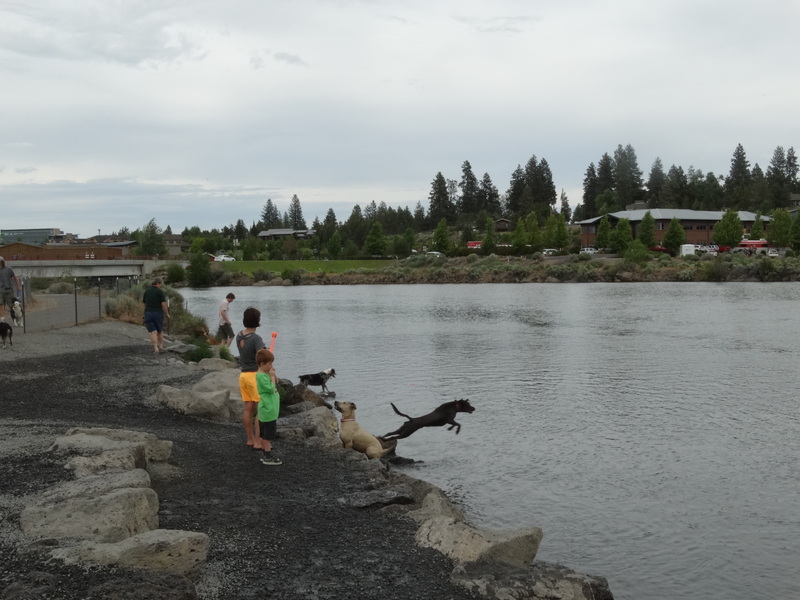 We are seriously considering moving to Bend after this trip so we wanted to spend a bit more time there. As an added bonus we will see our old friends John & Emily who who moved from the Bay Area to Bend this past year. What I didn’t realize is just how popular horse ownership is in the area. 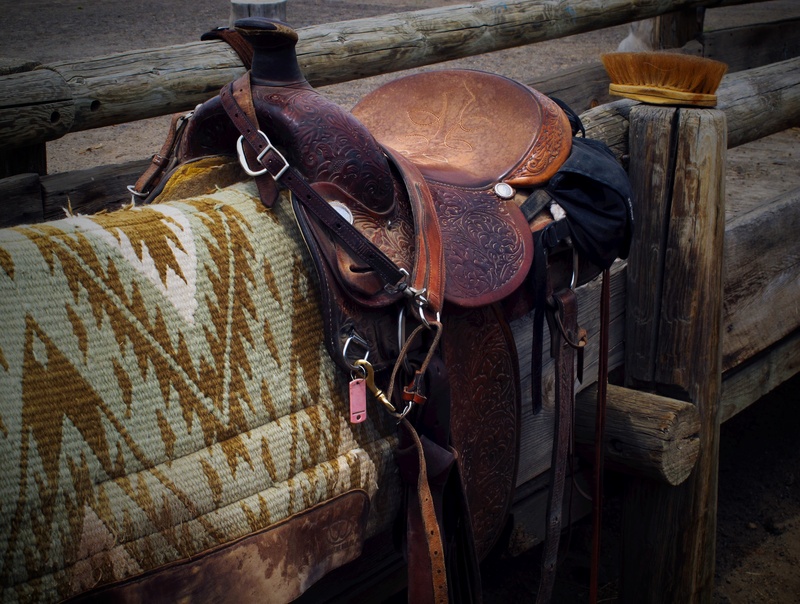 I did a little bit of research and found Flyspur Ranch which offered trail riding and lessons. I booked a lesson for the following day and a trail ride for the day after that. Kevin and Therese are the owners of Flyspur Ranch. They moved to Bend from the East Coast around 10-15 years ago and haven’t regretted the move one bit. It was evident how much they love their work which isn’t a job for them but a lifestyle. We talked with them about the challenges of owning your own business and specifically what it’s like to own a horse business like theirs. It’s a dream of mine to own a horse or maybe a few horses but we also love to travel. After our conversations with Kevin and Therese I see that there will be some interesting choices to make regarding these two lifestyles. But on this day, the only choice I had to make was choosing a horse to ride! 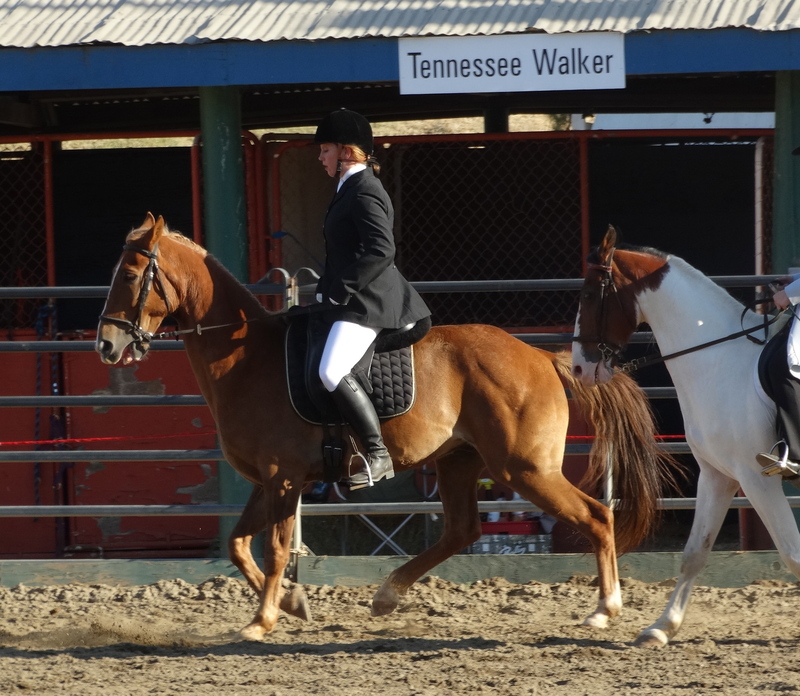 Therese’s horse is a Tennessee Walker and she offered to let me ride him to feel its gait. They have a unique gait that makes them ideal trail riding horses, nice and smooth on long trail rides and trail riding is what I expect to do with my future horse. I completely forgot to take any photos of Scout but you can see him here on their website: http://www.flyspur.com/ride.html. I was able to get a feel for his gait only a couple of times because the indoor arena didn’t give Scout the room he needs to really show off his smooth riding style. Plus my inexperience in riding didn’t help matters! The following day I decided to take their Percheron Bullwinkle (Bull for short) out on the trail. This was a completely different ride and I was amazed at how gentle this giant of a horse was with me. He stands about 15 hands high at the withers which is 60 inches. I’m 5′ 10″ tall but Bull made me look small! There was a deep river crossing on our ride, the first I’ve ever done, but on Bull, I didn’t even have to pull my feet out of the stirrups to keep them out of the water which was over four feet deep. I loved how sweet and good natured Bull was with me during our ride. I can already see that when I eventually do buy a horse I will have a difficult time making a choice between these different breeds. Kevin giving me some pointers. The next day we had a chance to catch up with our good friends John & Emily. 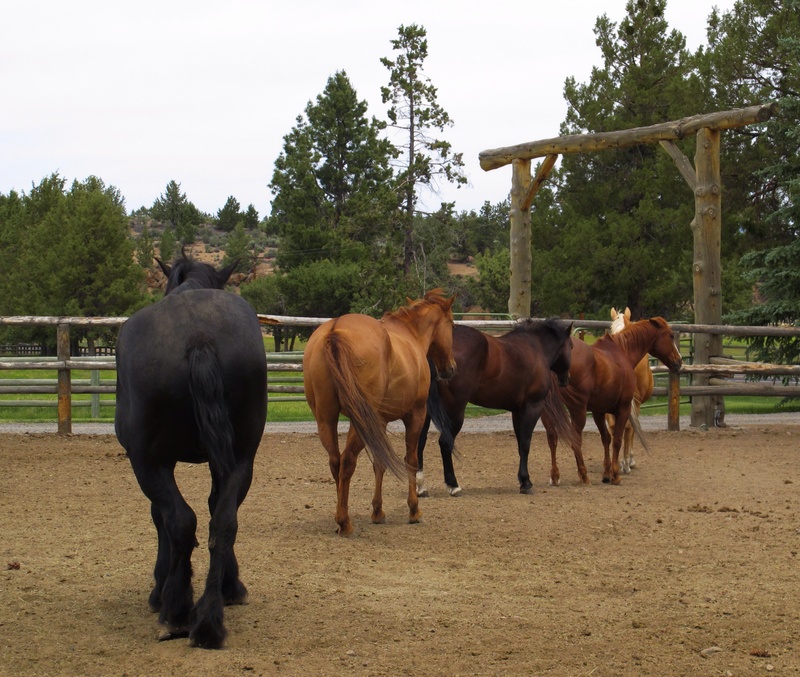 We met for dinner at the Tumalo Feed Store. Good food, great company and entertaining stories were on the agenda for this evening and we hit four stars across all three. 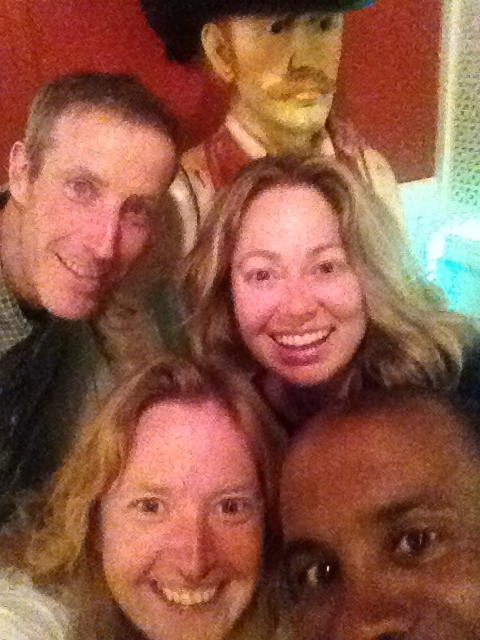 John shared his latest mountain climbing adventure in Nepal, Emily shared her tales of the first year as a new business owner of Call of the Wild; a guiding company that focuses on adventure travel for women, and Darryl and I caught them up on our adventures. There was a time when we saw each other every weekend but our lives have taken us in different directions so I cherish these moments when our travels allow us to cross paths with our friends from a former life. 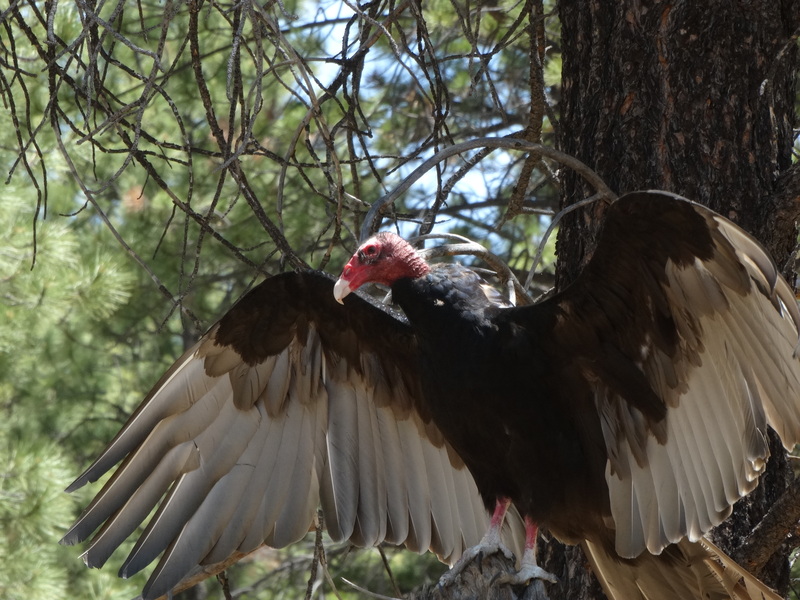 We made it to the High Desert Museum to see the Raptor Show which we also saw on our last visit to Bend. It’s an amazing experience where they have trained raptors who have been rescued and cannot be released due to their injuries. These birds have been trained to fly from perch to perch with hand signals indicating which perch to fly to and find their food reward. On this day we saw a barn owl, turkey vulture, falcon and a two others but I forgot what species. My favorite was the barn owl. They also brought out a great horned owl for photos. 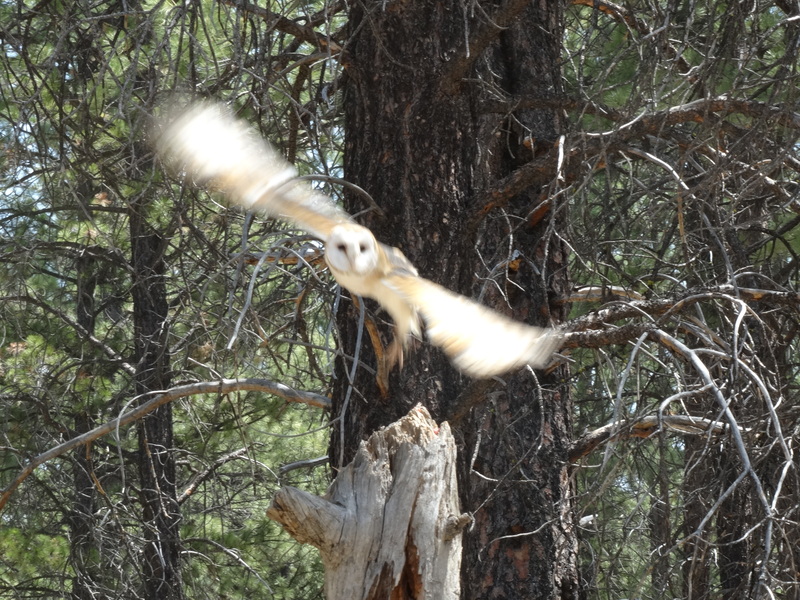 Check out this cool video of the barn owl flying over our heads. They tell parents at the beginning of the show that they should not have their children on their shoulders because the birds might accidentally strike them as they fly overhead. That’s how close they get to us! 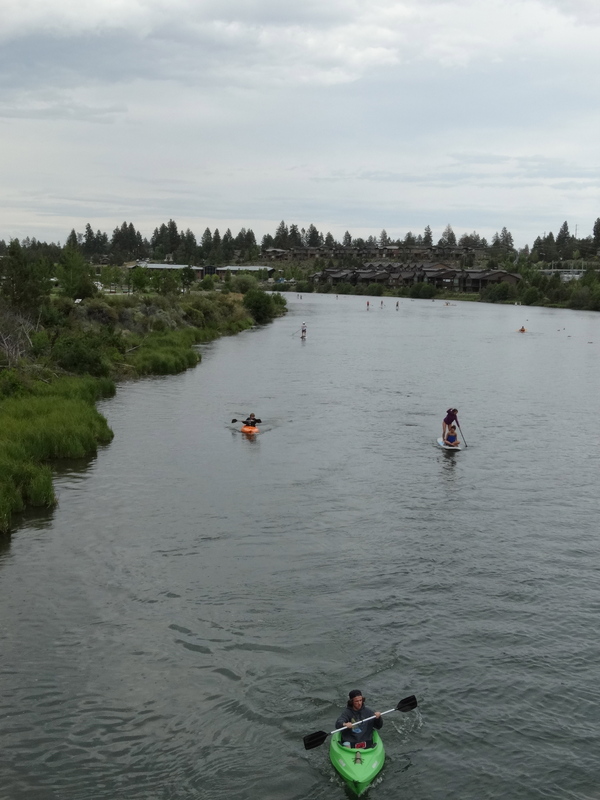 The rest of our time in Bend was spent eating at our favorite lunch spot (Planks) and running along the beautiful Deschutes River. We spent many hours just walking along the river and watching the various water activities. They have the coolest little dog park on the bank where dogs can fetch tennis balls from the river for hours on end. This is definitely a place that we could call home but there are a few more spots for us to see before we make this a final decision. 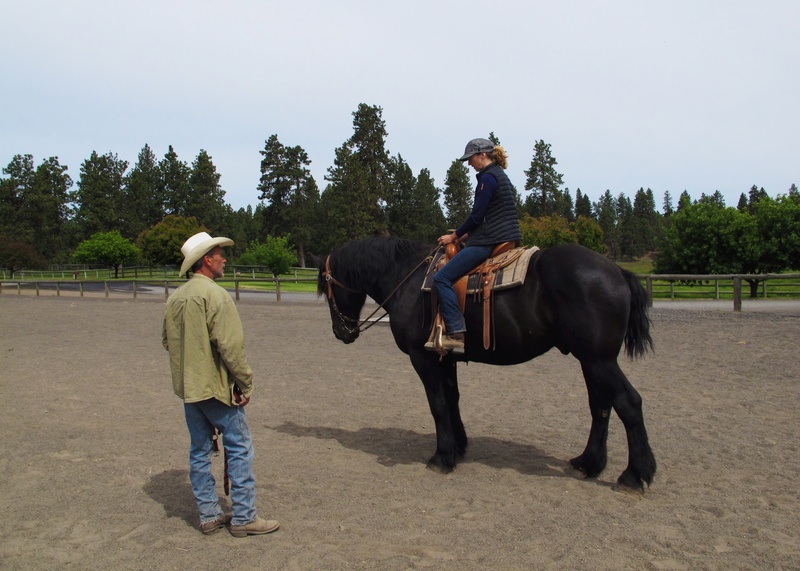 After our day at the Horse Expo we returned to the originally planned route to Oregon. We arrived late in Ashland, Oregon which is just north of the California border. We stayed long enough to get some rest at the Columbia Hotel in downtown Ashland. We were pleasantly surprised with how charming the hotel was. I had my doubts when I saw that we would be sharing a bathroom with the other guests but our stay there was great. We had breakfast at Morning Glory restaurant, again. Darryl found the restaurant the last time we visited Ashland. Why try something new when we know this will be excellent?! 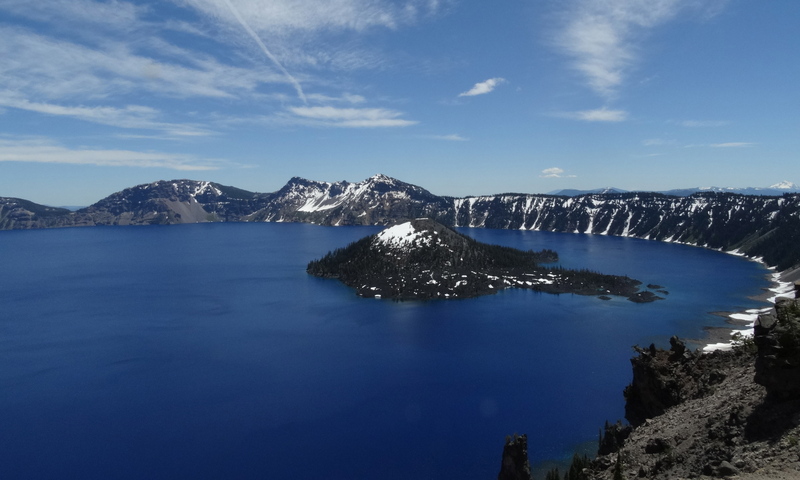 Our stay in Ashland was short since we wanted to get on the road to see some new territory and today that would be Crater Lake. I spoke with the National Forest ranger to find out where there was dispersed camping near Crater Lake. He recommended Union Creek just off of highway 62 near Prospect, OR. This place was recommended by the couple we met at Boulder Beach campground in Lake Mead so we decided to make that our destination. I haven’t felt this small in years! The next morning we drove to Crater Lake and spent the day enjoying the views. There was still snow on the ground and it was a bit chilly out. I was expecting to see cabins and boats around the lake similar to Lake Tahoe so it was a surprise to see the lake practically untouched by development. There is a small boat dock on the lake that can take people to the island at the center but you can’t see it from most of the viewpoints. We hiked down to the boat dock at lake’s edge and watched the younger crowd jump into the lake’s chilly waters. We preferred staying warm and dry! We didn’t expect to stop in California but we saw a sign, literally, that put Sacramento onto our trip itinerary. 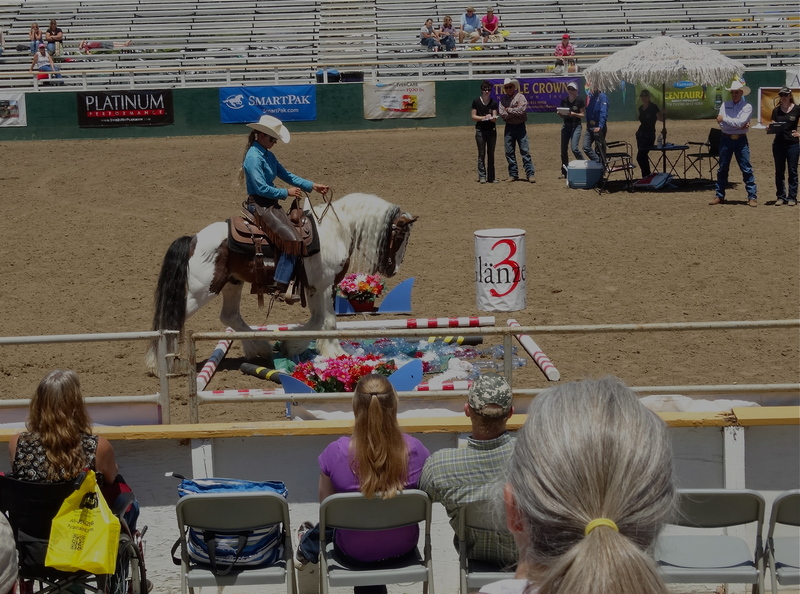 We were driving along I5 when we saw a billboard advertising that the Western States Horse Expo at the Cal Expo center would be in Sacramento the next day. We made a last minute decision to go to Sacramento for the night to attend the Expo. 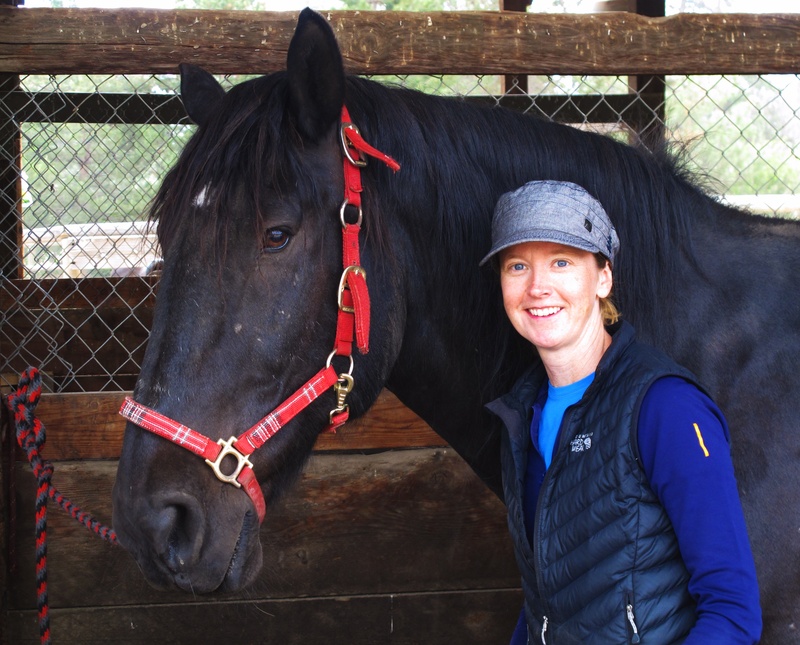 This would give me a chance to see a number of different horse breeds and talk with horse breeders, riders, and experts about what it really means to own a horse. We went for the first day of the Expo and I attended a couple of seminars but the best part of the day was talking with the exhibitors at the Breed Revelation. I heard first hand from the breeders and owners about the characteristics of the specific breeds and why they chose their breed of preference. Before the Expo I was only familiar with the Quarter Horse, Clydesdale, Mules, Arabians and Mustangs but here I had a chance to see some new breeds that I’ve never heard of like the Halflinger, Gypsy Vanner, Percheron, Peruvian Paso and Tennessee Walking Horse. Here are some photos of the above breeds that were taken during their breed show events. There was an event called the Ultimate Super Horse where riders went through a series of challenges that were unfamiliar to the horse. 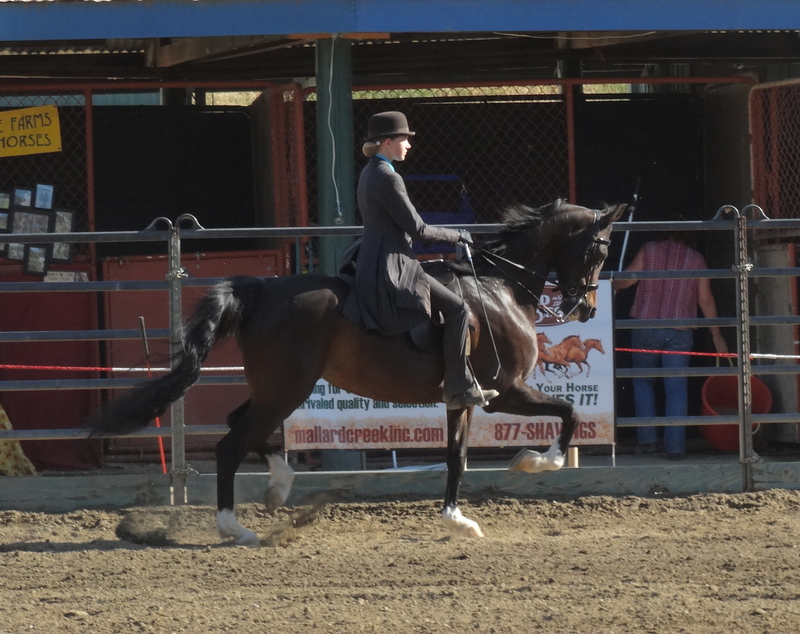 The rider would demonstrate their control over the horse and the successful horse would navigate these challenges with little or no resistance. Below are a few photos of these challenges. Some examples of challenges not pictured include where a person with a bicycle would run with the bike weaving next to the horse and rider and another where a person dressed as a hiker would walk out in front of the horse waving their hat and making a wide gestures in front of the horse and rider. 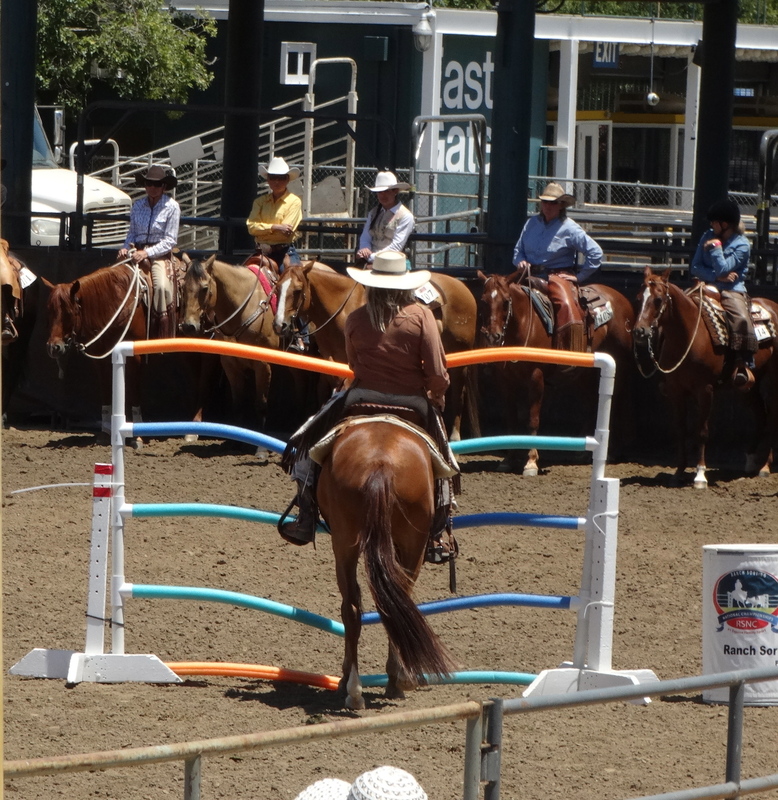 All of the riders that we saw made it through the stations but some horses were more hesitant than others to go through them all. This Gypsy Vanner made it through the shiny / noisy junk obstacle just fine. 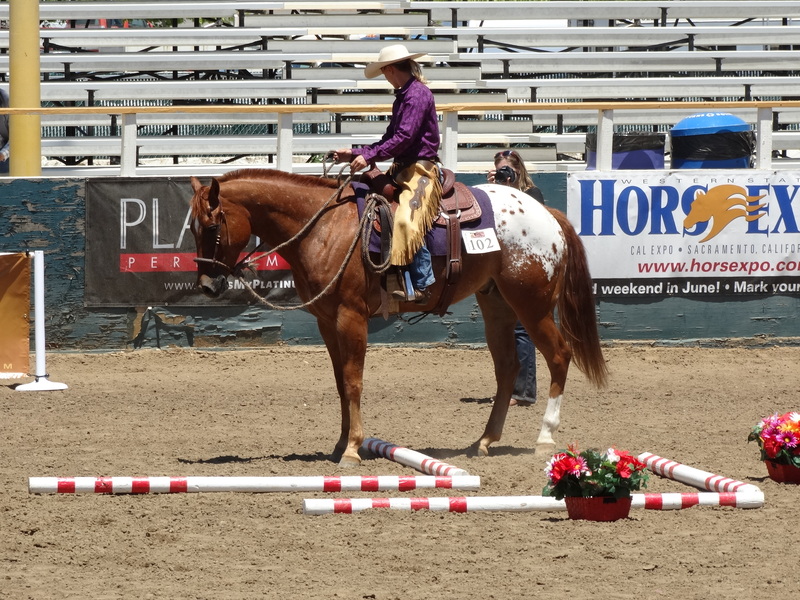 This Appaloosa was the best at this challenge where they had to walk side-ways with the pole between front and rear legs then walk backwards staying between the poles. Here the horse had to walk through these scary pieces of foam. 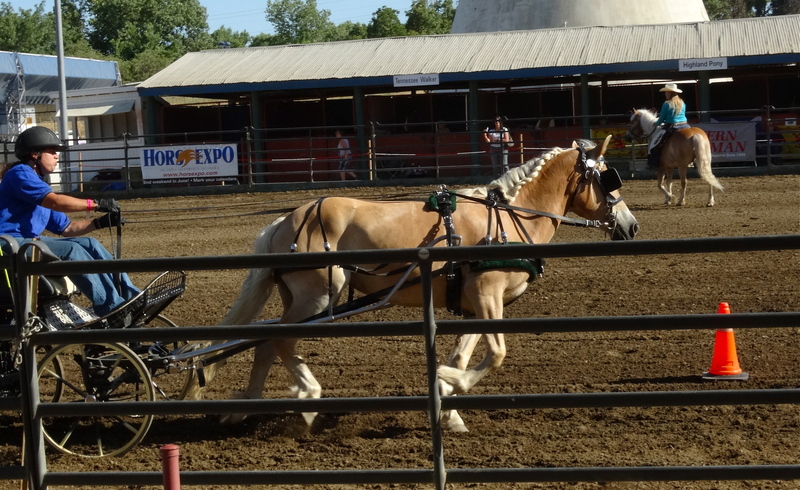 Later in the day we watched the draft horses in action pulling wagons either individually or as teams. 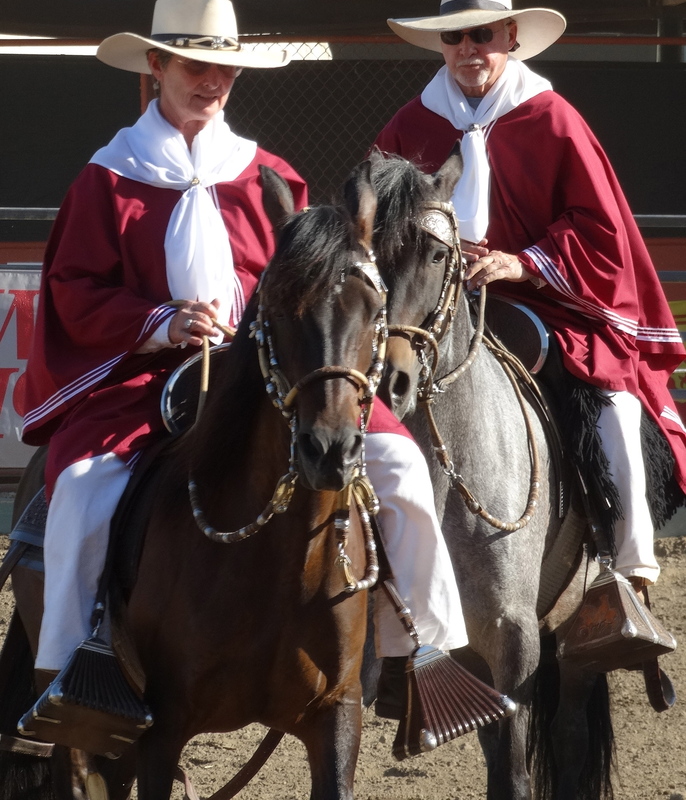 The Percherons were my favorites! Here is a video of a team of six galloping through the arena. At the end of the day we spent some time talking with Lynn of the Gypsy Rose Ranch. 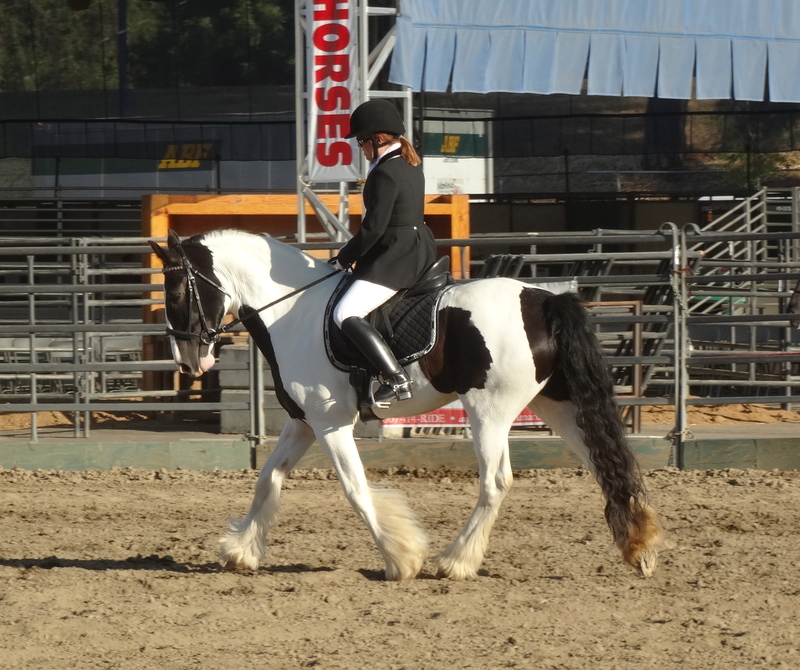 The Gypsy Vanner captured my interest so much that I made plans with the breeder to stop by her ranch in Lodi, CA on our way through California later in the month. We only spent one day in Yosemite on this trip but we have been fortunate to have had the opportunity to spend many, many days in Yosemite over the years. Living in the Bay Area we were only about 4 hours from the park and we took advantage of the proximity to this valley. One of our first trips to Yosemite was to climb Half Dome during a full moon. That was an experience we’ll never forget. From the top of Half Dome we could see flickering embers of distant controlled burns and the valley glowed with the moonlit granite monoliths. It is one of my favorite memories of Yosemite. Our other favorite times to visit the valley is after a snow during Christmas or Thanksgiving when there are only a handful of tourists around. The park is transformed by the snow making it feel like your own little winter wonderland. On this visit we arrived just before midnight during the height of the tourist season which also meant that there were no campsites available. We didn’t have any reservations and the only place to stay in the valley was at Housekeeping Camp which was our most expensive campsite of the whole trip for a slab of cement, three walls covered by a tarp and a cot with no bedding to sleep on. It was the last place that I wanted to stay given that a few people contracted hantavirus from the accommodations. It’s a deadly virus spread by mouse droppings. I didn’t sleep well that night with dreams filled of mice climbing the walls and crawling on me. We spent our day in the valley visiting Yosemite Falls and walking up to Lower Yosemite Falls. 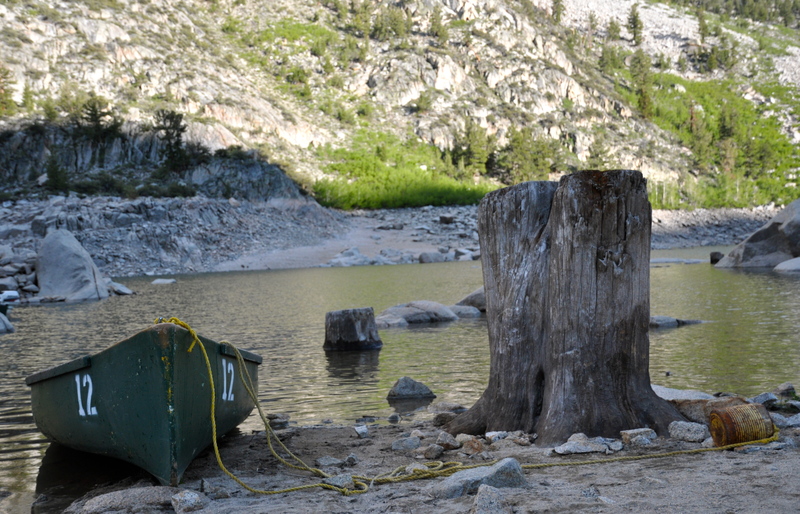 We watched a few people jumping off the bridge into the Merced River then relaxed near El Capitan. I was able to put my new binoculars to use by spotting climbers inching their way up the massive granite face. We’re pretty happy with the binoculars which I purchased at REI. I wanted something of a reasonable size that I could take on our hikes in Alaska in the hopes that I can spot some wildlife at a safe distance. We settled on the Nikon Monarch M511 8×42. We left our favorite valley sometime in the late afternoon continuing toward Oregon via Sacramento, CA to Ashland, OR. Parked outside our tent at Housekeeping Camp. Climber on his way to El Capitan. A view of Upper and Lower Yosemite Falls. Hanging out at the base of Lower Yosemite Falls. Sunlit butterfly on our walk along the Valley floor. 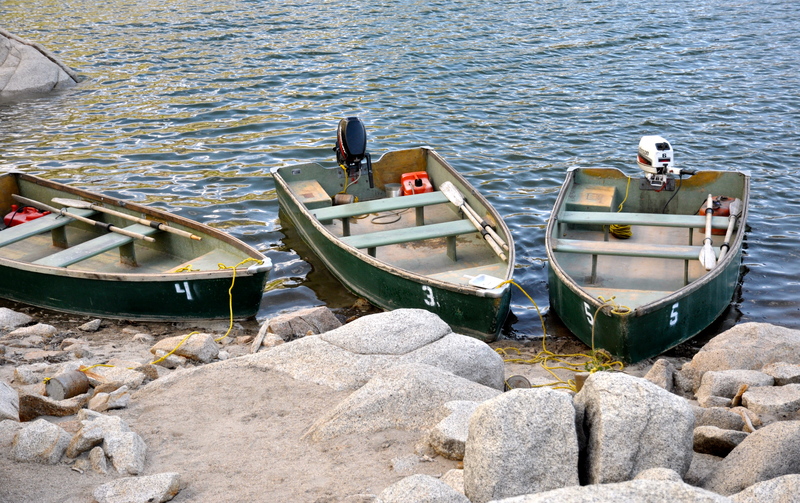 Close-up of the Merced River. Keeping cool in the waters of the Merced. Bridal Veil Falls blowing in the winds. After picking up my license from Crowley Lake we went back north to Mono Lake. This is just north of the junction of 120 and 395. 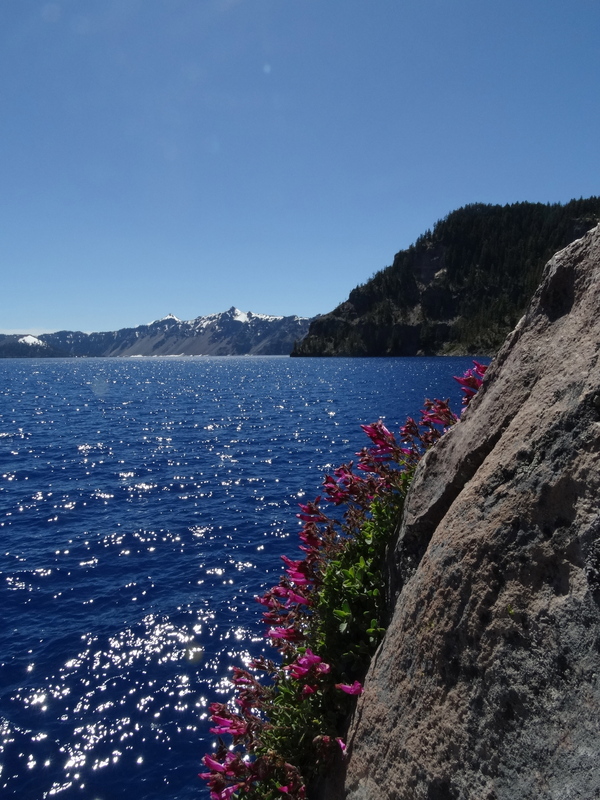 It’s one of the bluest lakes that I’ve ever seen. 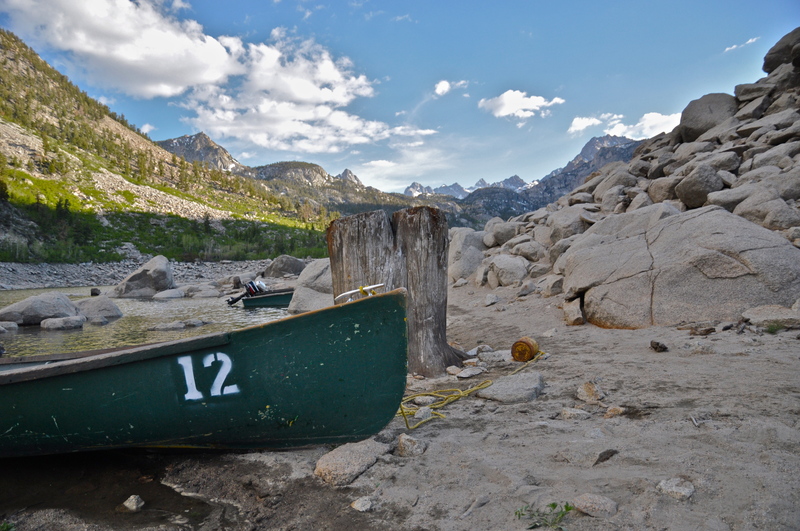 Set against the backdrop of the barren eastern sierra makes the blues of the lake pop. 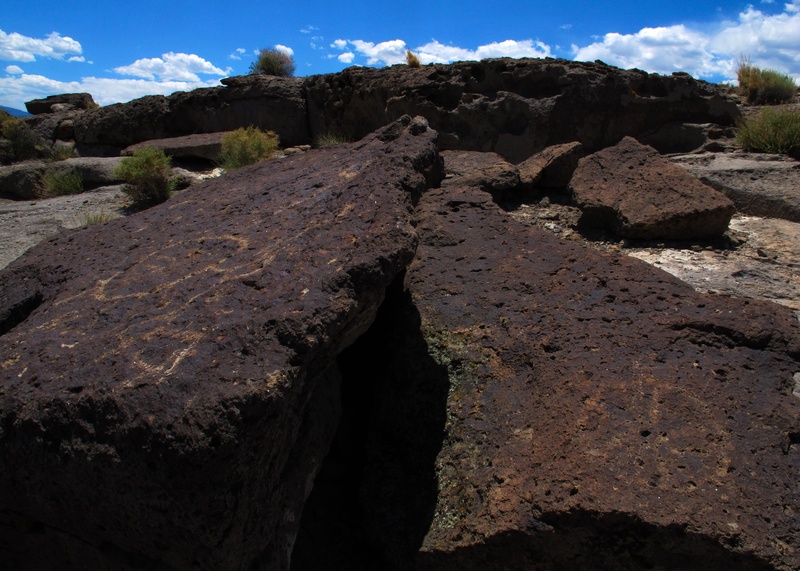 Along its edges are tufas which are made of calcium-carbonate crusts. There are brine shrimp and alkali flies that birds feast on during their transcontinental migration along the great flyway. It’s a magnet for photographers who arrive by the van loads to capture the landscape in the softer evening light. We left at about the time they arrived and didn’t capture the sunset. We still had a lot of driving ahead of us to get to Yosemite Valley and we still had to stop for dinner. Our time at Mono Lake was short but as always, it was a lovely way to spend the late afternoon. After Bishop we started our drive north on 395 toward Bodie. The plan was to buy me an annual fishing license since I purchased only a day license earlier. 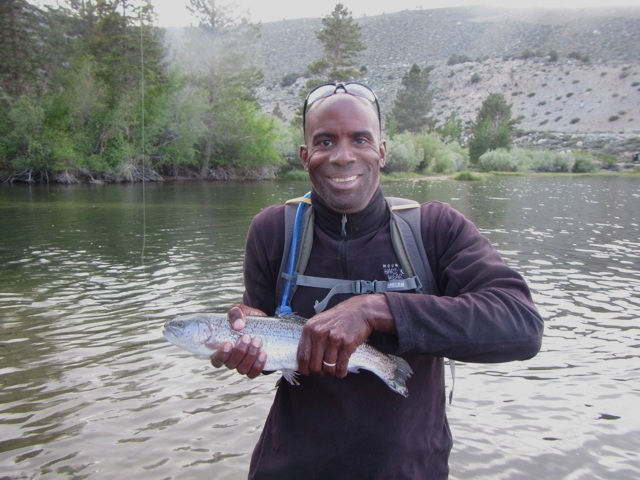 Darryl already had an annual one knowing that he would want to fish later in the trip. After Crowley we would spend the night on the BLM land outside Mammoth. We stopped at Lake Crowley just long enough to purchase the license and take a few photos. 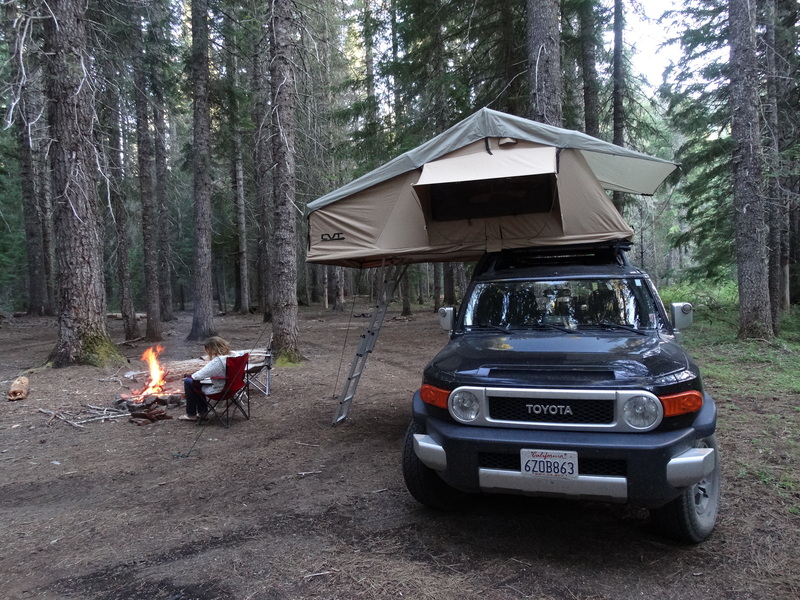 We camped a few nights on the BLM land outside Mammoth last December during our trip to visit the hot springs. There are about 5 hot springs in the area and we visited all of them during that earlier trip. The hot springs didn’t sound as appealing in 100+ degree weather so we skipped them on this stop. The area is a popular place for campers considering the popularity of the hot springs which can get a little crowded at times but the views make it well worth it. This is a photo at Wild Willies hot tubs from our December-2013 trip. This evening we were treated to a beautiful sunset with rainbows and storm clouds that threatened rain but never delivered. The next day we stopped into Mammoth for breakfast then did laundry. After our morning of errands which included laundry and buying me my fishing pole and lures we found a little fishing spot along the Mammoth Creek so Darryl could give me a spinning lesson with my new pole. I managed to catch the weeds right next to me, the bushes across the river and a tree and then a brown trout! It was only abut 4 inches long so we tossed it back into the river to continue its journey. 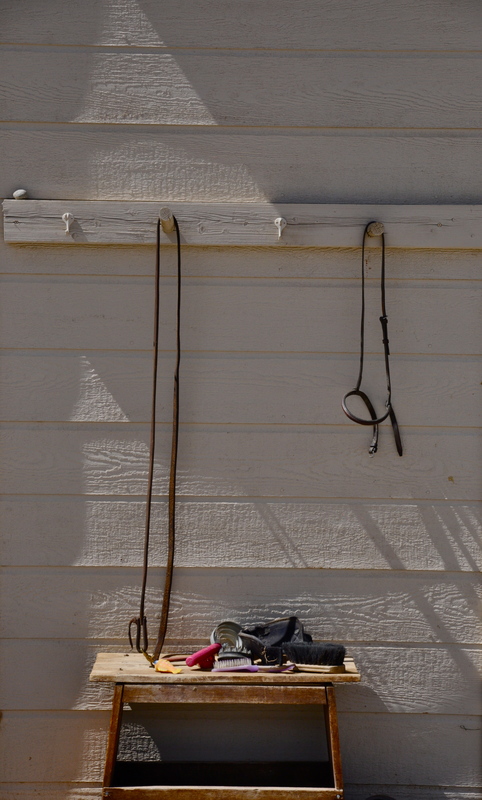 After my fishing lesson we went to Bodie. We love this ghost town having visited it once before almost 15 years ago. We overheard a waitress describing Bodie to a customer a few nights earlier saying that it’s kinda boring and if you go, you might stay for about 20-30 minutes. Well, we were there for almost four hours! If you like history and taking photos of interesting scenery with beautiful backdrops, this is the place for you. If you don’t like that sort of thing then maybe skip this side trip. Bodie is a typical gold rush era town growing from a handful of people to over 10,000 in just one year. There were some interesting characters that lived here back in the day. The town’s reputation for lawlessness is evident from this quote from a child’s diary after learning she was moving to Bodie; “Goodbye God, I’m going to Bodie.” Evidently the law did rule the business relationships when James Cain sued Standard Mine, the largest gold mining company in town, for drilling on his mine. He won the lawsuit and ended up owning the trespassing company when the resulting fines broke them. You won’t find any services at Bodie except for a few porta potties. The state park service maintains the town in a “state of arrested decay” which I think means that they do the bare minimum to preserve the town’s structures. There are quite a few tourists that come through but not so many that they obstruct the photographs. It’s only about 30 minutes north of Mono Lake off of Hwy 395 up a well maintained dirt road. 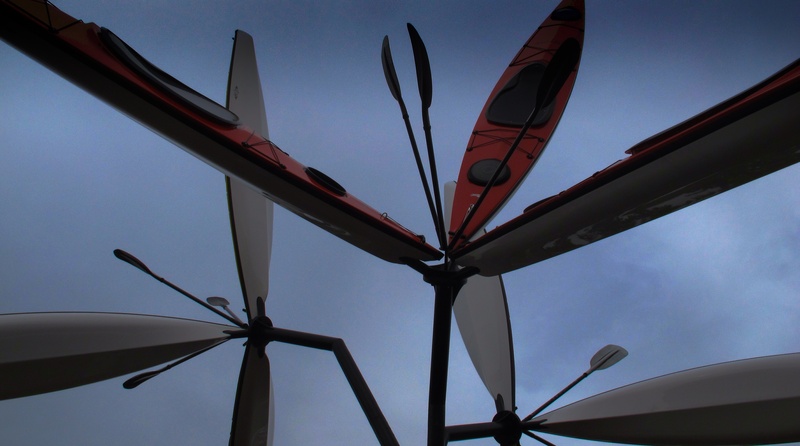 We recommend taking the time to make a short side trip if you like this sort of thing. On our way back from Bodie I noticed that I forgot my drivers license at Crowley Lake. So instead of camping at Mono Lake we headed back down to Bishop so that I could pick up my license the next morning. It’s a good thing we don’t have a set schedule! 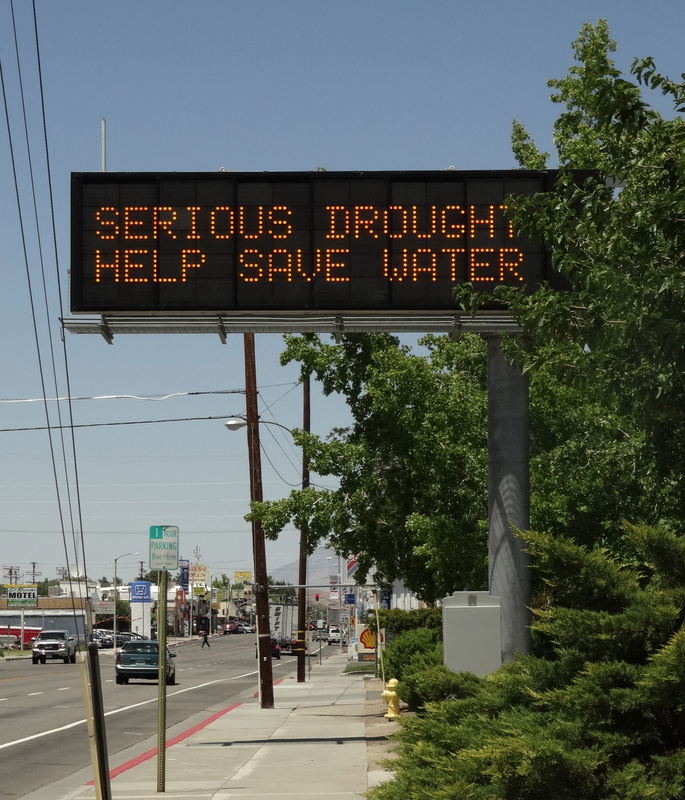 Welcome to Sunny and very, very, very dry California! Now that we arrived in California, our next destination was Bishop, CA. 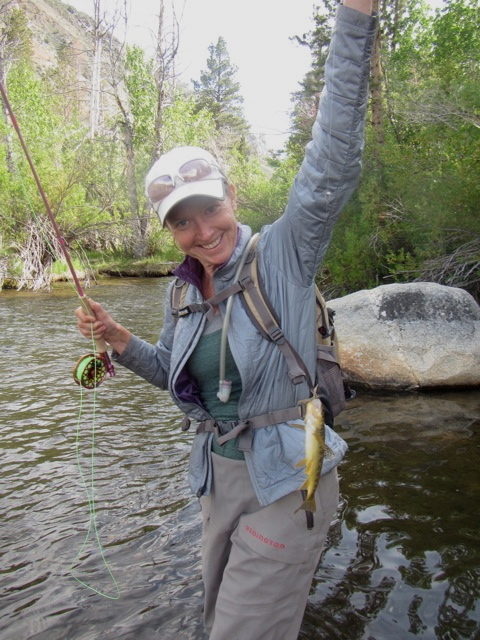 We heard that Bishop was a nice town in the Eastern Sierra popular for its fly fishing and hot springs among other activities. We decided to stop through there on our way to Mono Lake, Bodie and Yosemite. 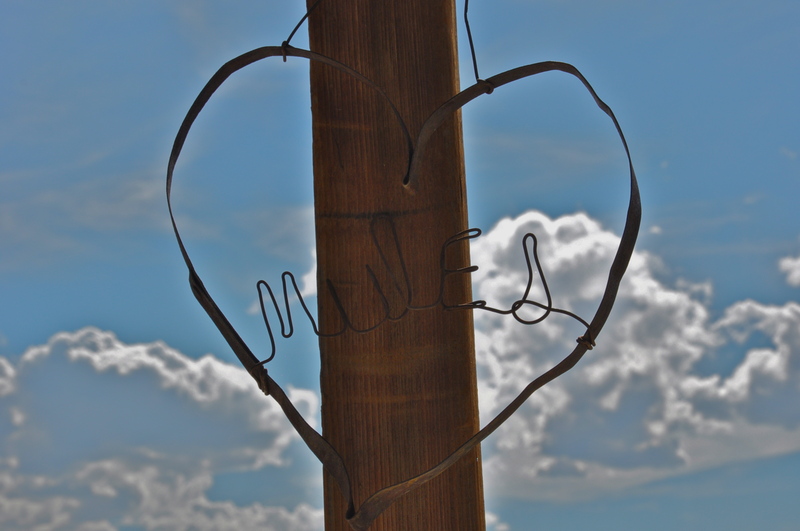 Bishop is a small town with a lot of character and we fell in love with it! Our quick drive-by became a 5 day layover. Mammoth is a small town of about 8,000 people. The town lies within the Owen’s River Valley backed up against the mountains with nearby Mt. Whitney. Just the sort of place to spend a few days to get to know its character and the perfect spot for us to explore some new hobbies. 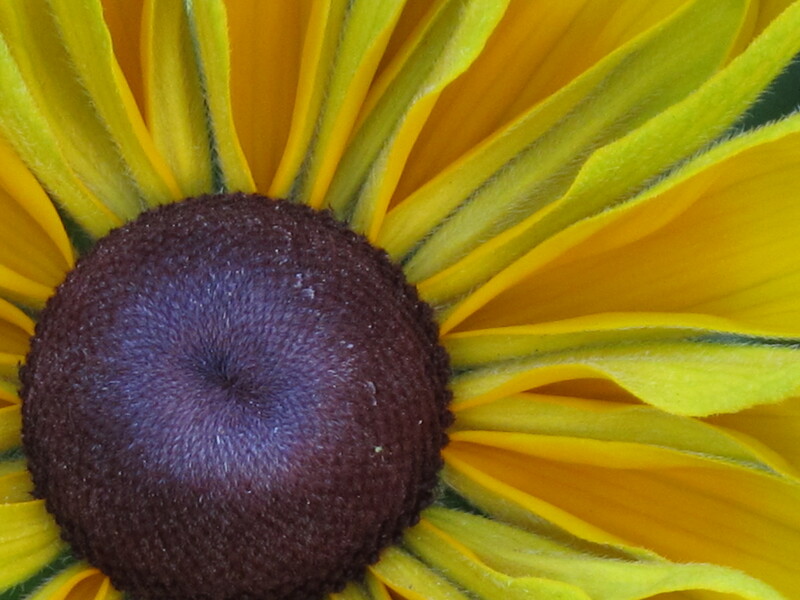 Photography is one of Darryl’s interests and he was familiar with the work of the late Galen and Barbara Rowell. Their studio is Mountain Light Photography gallery located in Bishop. They were able to capture moments that the majority of us with cameras never see. There were stories alongside many of the photographs explaining how the photo was composed, the time of day and the inspiration. These photos didn’t come by chance, they were planned and their patience paid off. They traveled the world for their photography and we’re looking forward to seeing many of these places along our own journey. 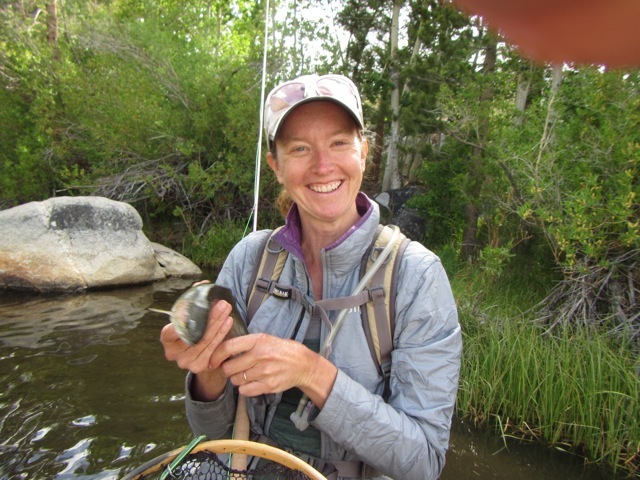 Our time in Bishop turned into an experience of personal discovery for us where we indulged in our personal interests one of which is fly fishing. During the past year we started looking into the sport and in the fall of 2013, we spent a day with the late Bill Lowe of Sacramento, California. 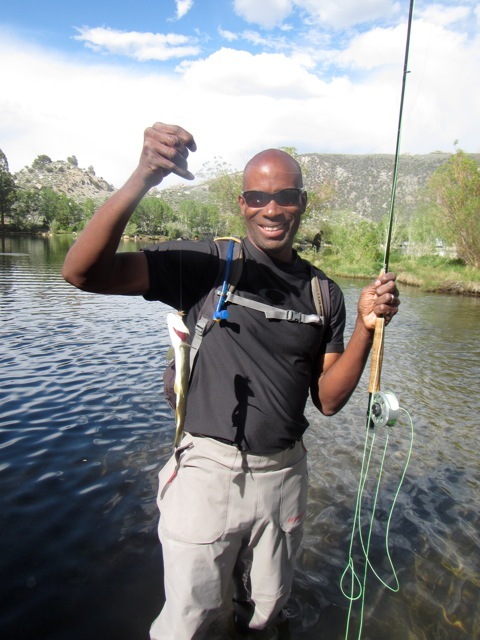 He was a fly fishing guide and a wonderful teacher of the sport. We had a great time on the American River where Bill taught us the fundamentals of fly fishing, casting, how to read the currents and a basic intro to entymology. The day piqued our interest enough to purchase the gear and put our very basic skills to the test as we travel. 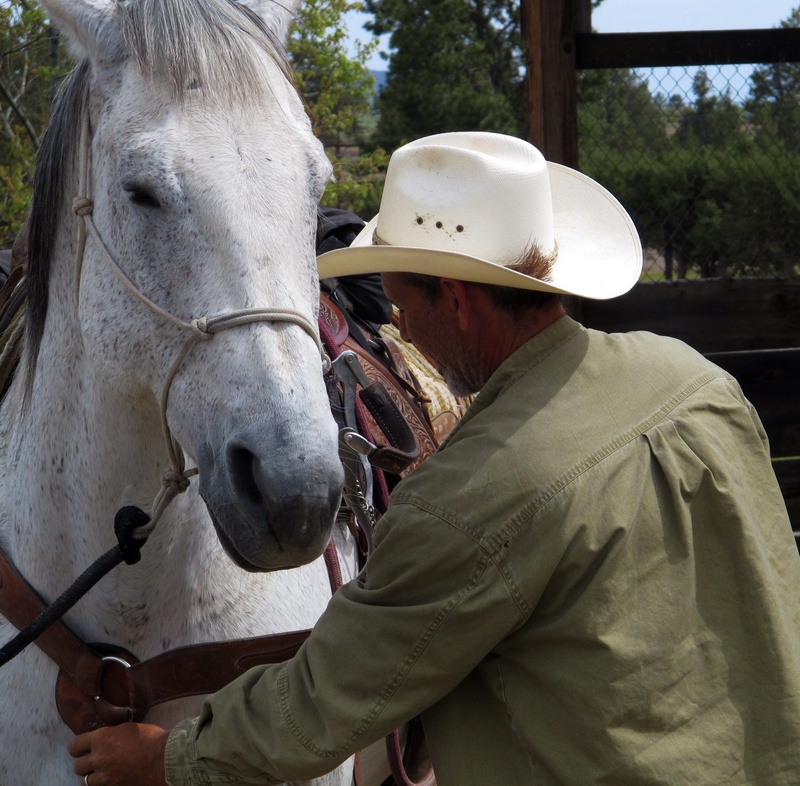 In the spirit of exploring our interests, Darryl encouraged me to call on one of the many horse trainers in the area. Like many little girls, I was obsessed with horses when I was growing up. My dream was always to own a horse but I never pursued this dream. I had lots of excuses for not doing so like too much work and not enough time. Darryl pointed out that I don’t have these excuses anymore so why not reach out to really learn about what it means to be a horsewoman? 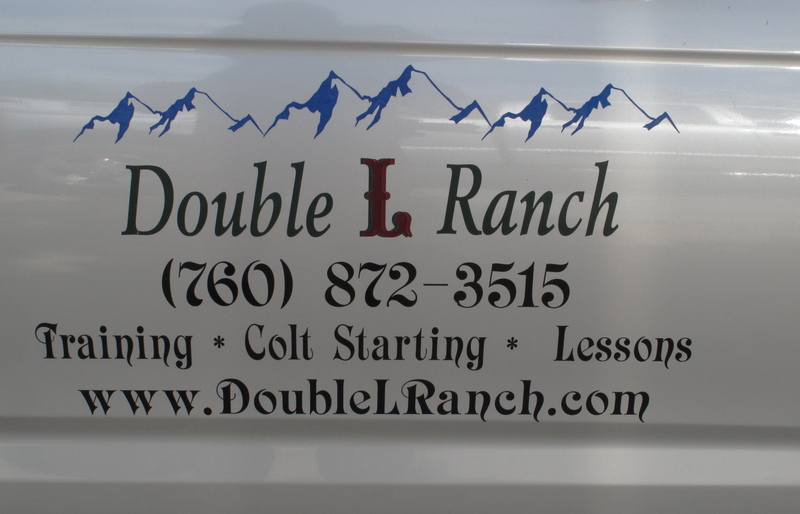 I found a horse trainer, Linda of the Double L Ranch, and gave her a call fully expecting that she wouldn’t have time to answer my silly questions. To my surprise, she spoke with me for almost 20 minutes giving me some advice on how to pursue this dream while traveling! 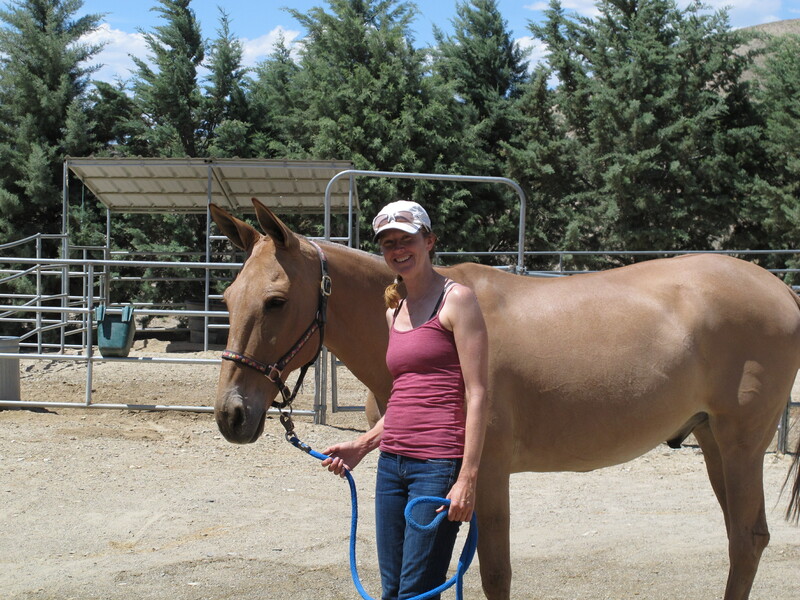 She also introduced me to the idea of owning a mule instead of a horse. I have never heard of such a thing and learned that mules are 15x smarter than a horse and are more sure-footed than horses on the trails. 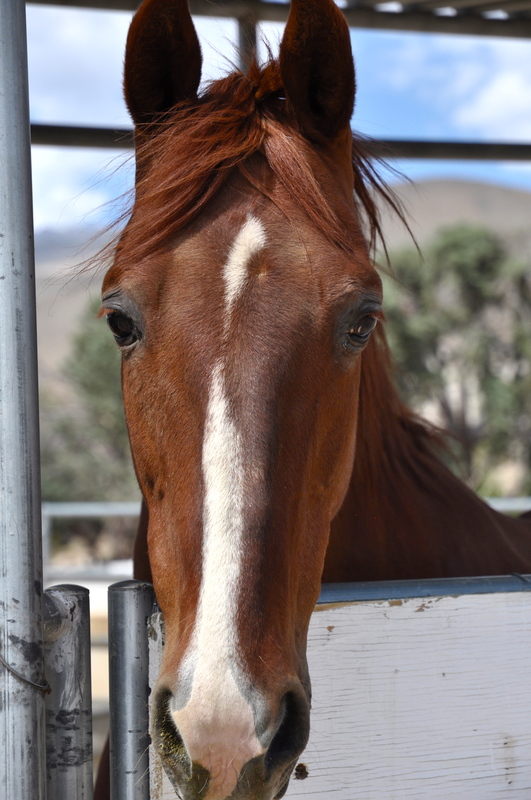 Mules also tend to establish a stronger bond with their owner than a horse does. This was all very intriguing to me. We stopped by the Double L Ranch to see if she had time in the next couple of days to give me a riding lesson. She had time right then but I didn’t have the proper boots to wear. So instead, she spent the afternoon showing me how to groom and tack a horse and then had us stay to watch a riding lesson. She walked us through the basics of what she was looking for and what she was asking of the rider. It was a wonderful introduction into this world! But I really wanted to get onto a mule so she sent me to the local horse riding outfitter to buy some proper boots to wear and agreed to give me a lesson the following day. 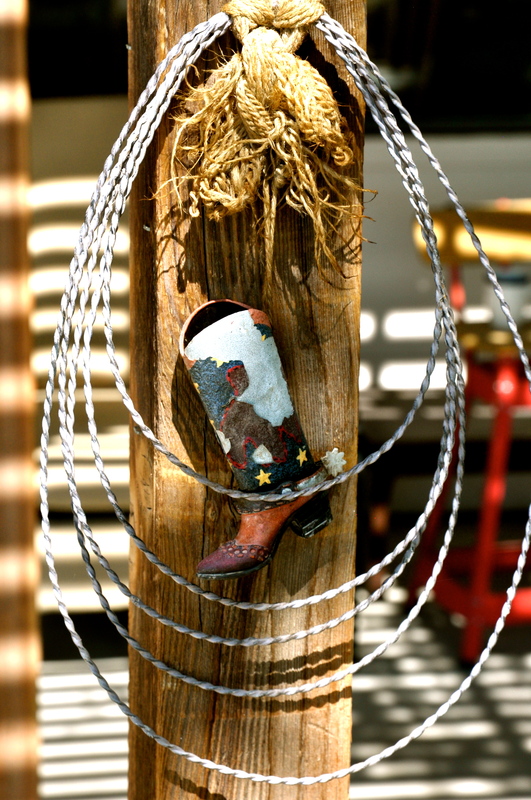 Here are some photos from the ranch. They love their mules here! 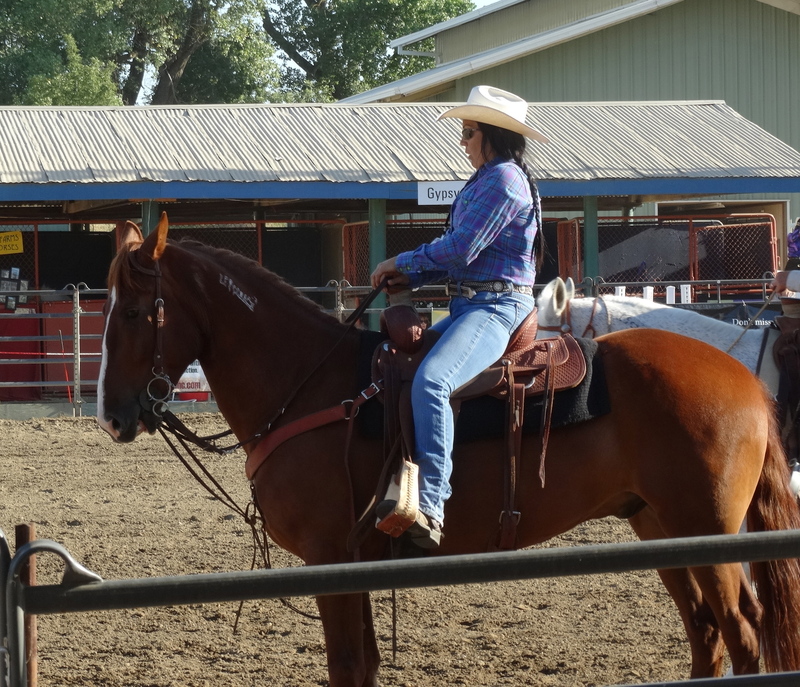 The next day I arrived ready to start my lesson and Linda introduced me to Max, their champion mule. We thought that I would have a chance to ride him but he wasn’t very interested in being led to the riding area. Since this is uncommon behavior for him, Linda looked him over very closely and found that he had a sore on the back of his leg so we put him back and pulled out Jazz, a chestnut quarter horse. Max the mule. Isn’t he handsome!? Cleaning Jazz’s hooves before our riding lesson. Linda giving me a few pointers before we head out into the arena. Keep your head up and your eyes forward! Getting the hang of it. Look at that view! Jazz enjoying her cool down after our lesson. Another beauty on the ranch. She was curious about Darryl’s camera until the shutter clicked and the she bolted. After our time at the Double L Ranch we drove up into the mountains to cool off. 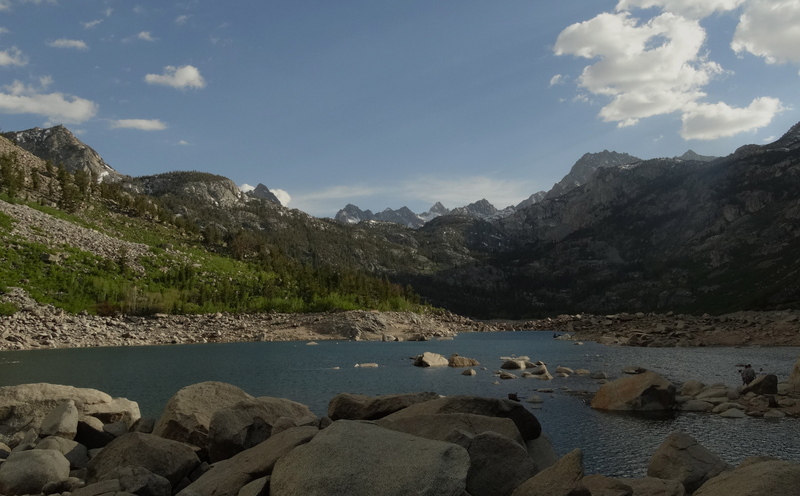 We stopped to enjoy the view at Lake Sabrina. 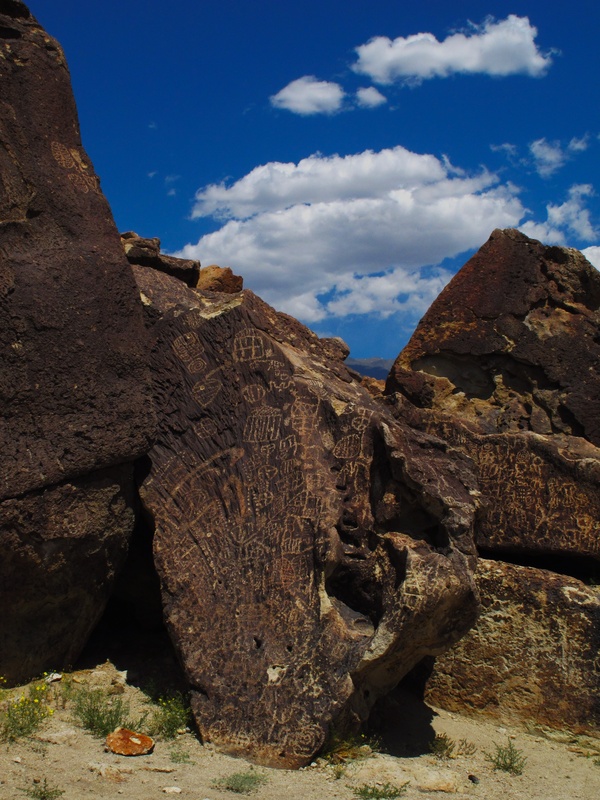 Before leaving Bishop, we drove through Fish Slough to find the petroglyphs that we heard were out there. Darryl read about them but it was difficult to find any information on their exact location. 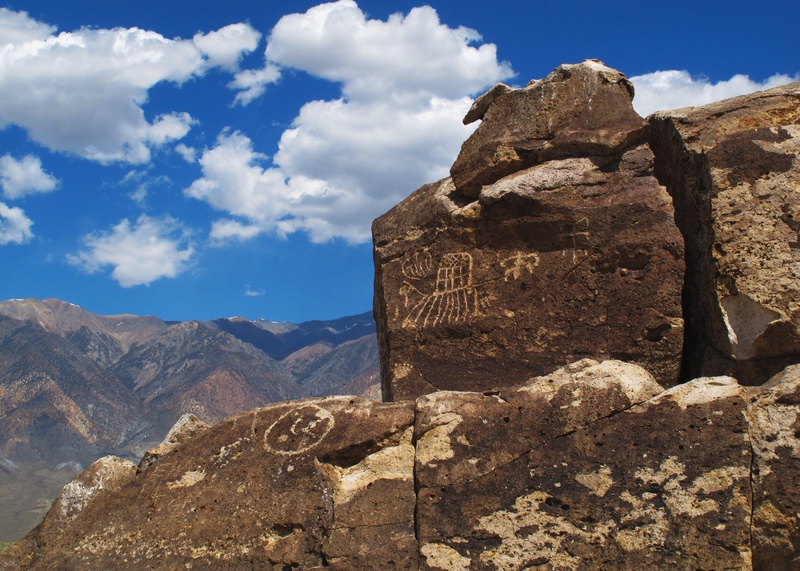 It seems that there has been much vandalism to the petroglyphs. Vandals have written over them while others stole some of the pieces and in the process they destroyed some of the panels. 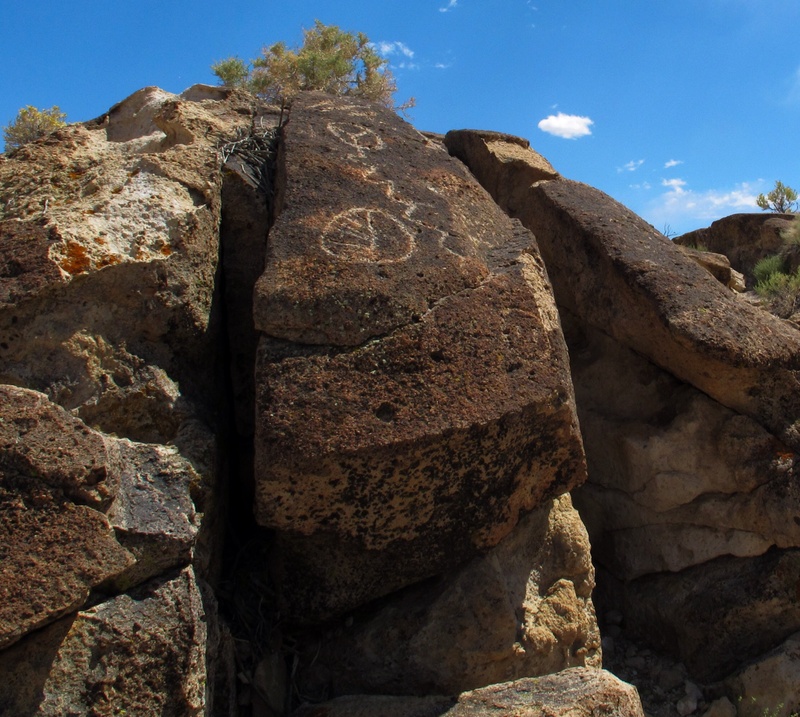 He did find the coordinates for the petroglyphs which were on the main road out to Fish Slough. 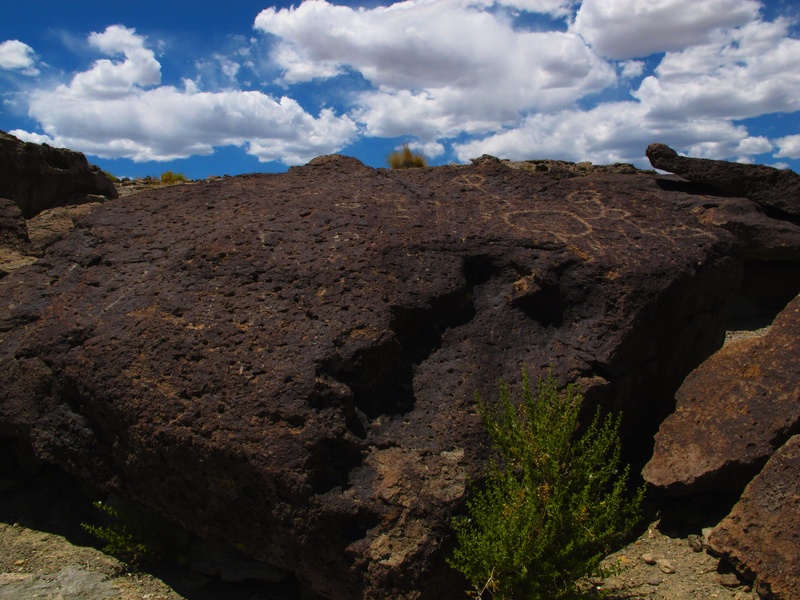 You can see the piece stolen from this boulder toward the front of it. 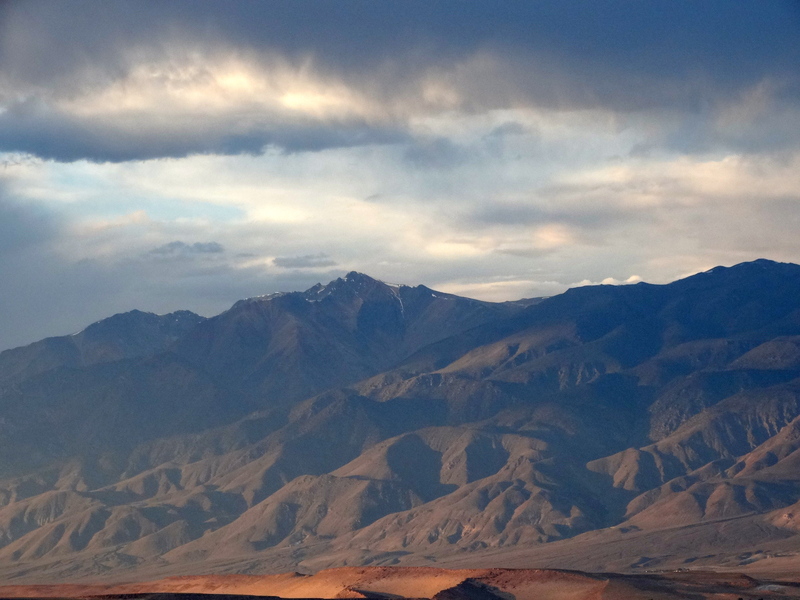 We had a wonderful time in Bishop and look forward to returning sometime soon after our trip. 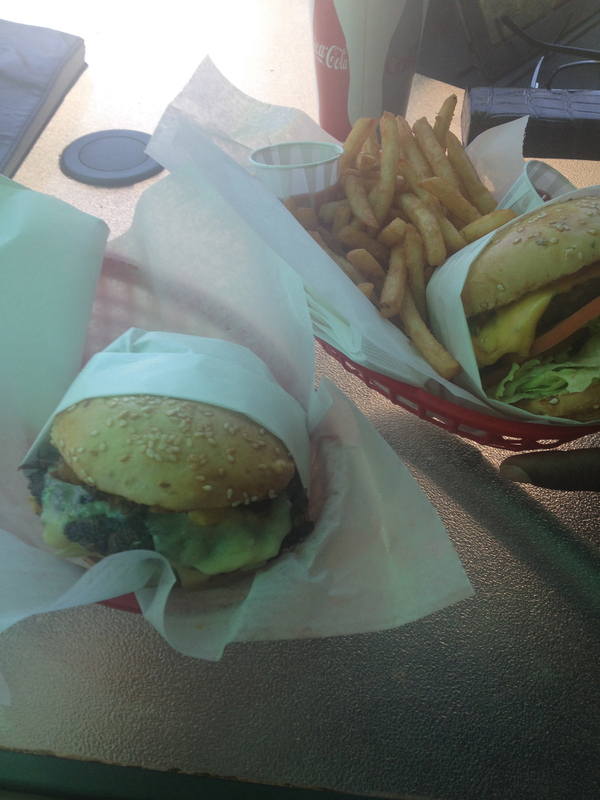 If you get a chance to go, check out the Burger Barn! We ate there twice while in town. The menu is a riff on the plain burger with dozens of options for your toppings. They get the fundamentals right starting with fresh food sourced locally and prepared well. It wasn’t anything fancy but oftentimes I find that fancy is overpriced and they under deliver. This place makes a reasonably priced meal that tastes great. My dirty hippie sandwich – a veggie burger topped with bacon and cheese. So good! !